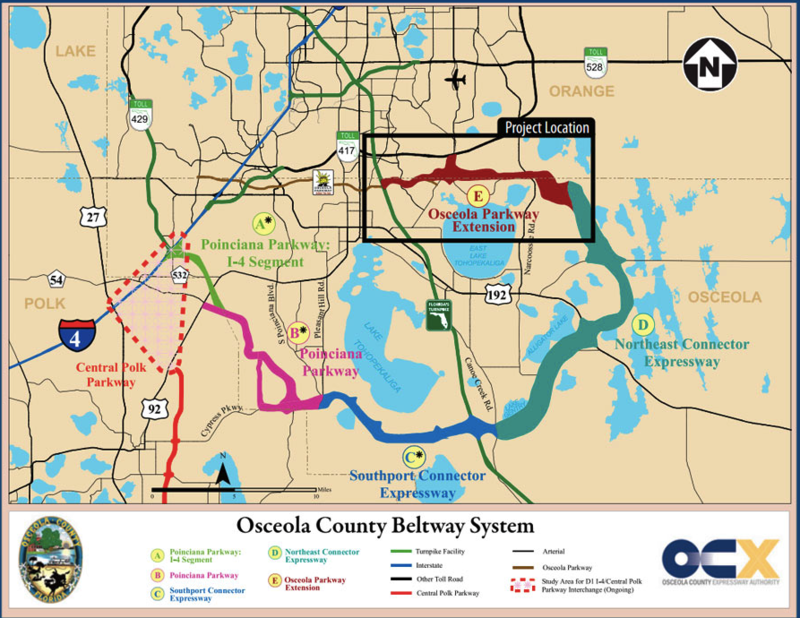 In April 2017, Central Florida Expressway Authority (“CFX”) began conducting concept, feasibility, and mobility studies on the unbuilt Osceola County Expressway Authority (“OCX”) Master Plan Projects. The study corridor for the Osceola Parkway Extension begins approximately one mile west of the Boggy Creek Road and Osceola parkway intersection and extends along the Orange/Osceola County line until it meets the north terminus of the proposed Northeast Corridor Expressway. The corridor is 9 miles long. On March 8, 2018, the CFX Board approved moving forward with the Project Development and Environment (PD&E) Study. OCX is currently considering 6 possible alternatives for the roadway. The goals for this limited-access facility include providing additional east-west capacity and relieving congestion on local roads. Maguire Lassman, P.A., a Florida law firm that represents property owners faced with the potential acquisition of their property through eminent domain, has access to Osceola County’s Right-of-Way maps. If you own property in Osceola County that may be affected by the Osceola Parkway Extension construction and you have any questions or concerns about Osceola County’s recently released maps or Florida eminent domain law, please contact Maguire Lassman, P.A.’s office manager, Teri L. Alligood, by email at Teri@Maguire-EminentDomain.com or by telephone at (888) 216-6870.